The overseer of the Floor Guardians and arguably the most powerful NPC in Nazarick. She takes the form of a beautiful woman with fallen angel wings and horns. Because Ainz modified her settings on a whim, she ends up madly in love with him. Albedo's romantic obsessions are so strong that if Ainz were to even glance at her body, she would immediately become excited. Albedo's obsession with Ainz has led him to greatly regret his actions. 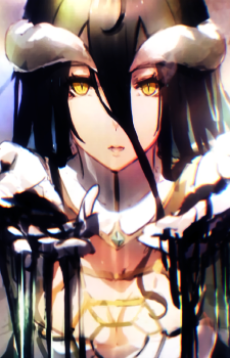 While she tries to act calm, as befitting of her role, any perceived insult against Ainz or Nazarick, real or imagined, sends her into a rage. Like most inhabitants of Nazarick, she despises humans which she refers to as "lower life-forms."